Gloves that provide a great fit, good comfort and good functionality. Firefox is an Indian performance bicycle brand with a wide range of bicycles and accessories for the bicycle and the rider. The majority of their bicycles and accessories are urban specific and are built for comfort. 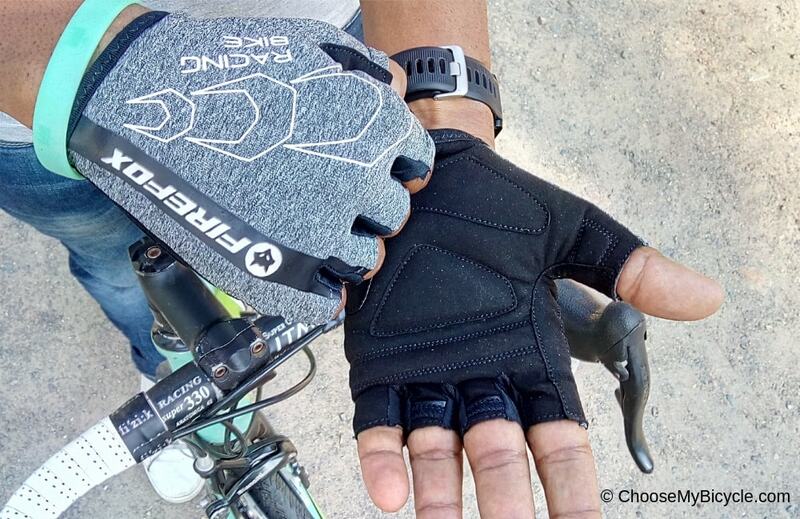 We got an opportunity to review the Cycling Gloves - Black/Grey from Firefox and here’s what we think. The Firefox Cycling Gloves are designed based on the structure of the human hand, which enhance the comfort and fit quality of the gloves. They are made of different materials on the upper and on the palm side. The upper has a flexible, quick-drying sublimation mesh fabric that expands like lycra to make sure that it snugly fits both wider and narrower hands while providing provides good ventilation and comfort. The inner palm-side of the glove is constructed from an anti-slip material that pre-vents the gloved hands from sliding off the handlebar, and features a double stitch de-sign for more durability. The outer and inner layers seem to be joined together seamlessly, giving the look and feel of a premium product. The Firefox Cycling Gloves have a two-tone color pattern, with the upper being a Grey color and the inner being solid Black in colour. To improve the grip comfort and durability, the padded parts of the palm have a double-stitched pattern. Foam pads are strategically placed at points where the palm comes in contact with the handlebar, which gives enhanced protection and helps avoid the feeling of numbness that arises from long hours of holding the handlebar. The wrist cuffs of the gloves feature an innovative strap-less design with an elastic band that eliminates the need for a velcro strap. This makes it easy to slip-on and slip-off the gloves. The “Easy pull-off” tabs that are placed in between the fingers make it easy to pull the gloves off the hand without inverting it. The gloves are available in 4 different sizes, namely Small, Medium, Large and Extra-Large to fit various palm sizes. Firefox has hit a sweet spot with the Black/Grey Cycling Gloves, as they are aesthetically good looking, functionally very robust and also well priced. Priced at Rs. 540 (As on 13th April 2019), these gloves are very cost-effective for the comfort they provide.